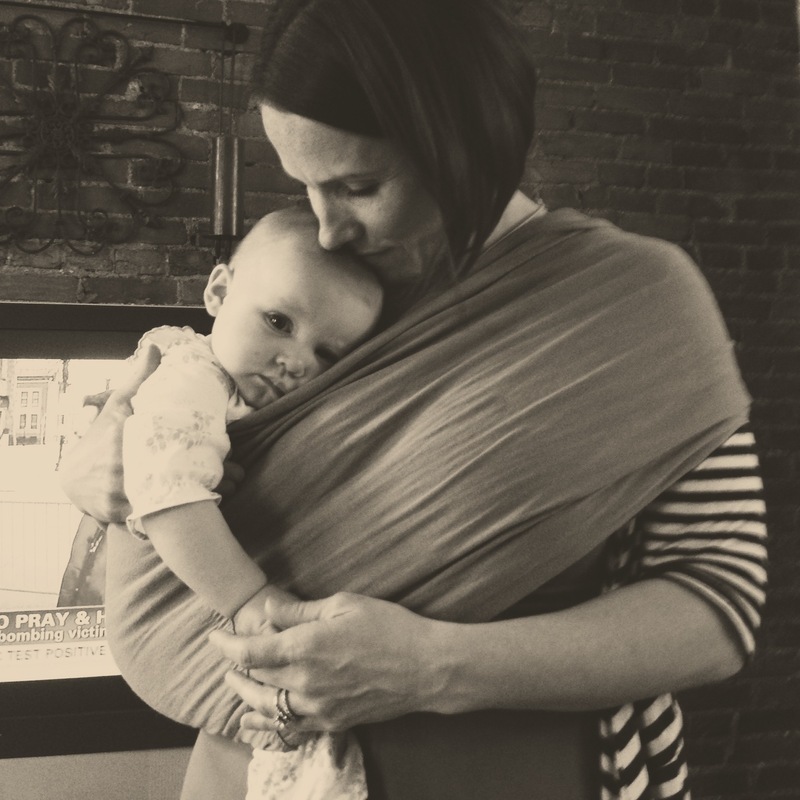 This is my 41st installment of Babywearing Stories 365. Each installment features a babywearer in 1 photograph and their answers to 5 questions. My goal is to normalize, promote and celebrate daily Babywearing, moving beyond *what* we use to carry our babies and shifting focus back on *why* and *where* we carry. I hope to share the stories of moms, dads, and babywearing caregivers all over the world. Today’s story is mine! Enjoy! I am Lizzy and I’m wearing my 8 month old daughter Eleanor (this photo was taken three days before her 8 month birthday). The photo was taken by my friend Kevin. For the first 4 months of Ellie’s life I wore her in a very comfy Baby K’Tan (color sage, size XS). Around 5 months I got my first woven wrap, so I started wearing her in that more often (blame the excitement of finally owning a Girasol! Lol). However, my K’Tan also serves beautifully as a very comfortable sling for quick carries and cuddles. April 18, 2013, three days after the Boston Marathon Bombing. I love this moment for so many reasons. It was refreshing to reconnect with Kevin. He was my supervisor before I left my career in student affairs to be a full-time mom, and we used to spend a lot of time together, so I cherish our time now that it is less frequent. We had CNN on in the background, as we were both still quite glued to the news looking for updates about Boston. In the bottom corner the TV says “pray”, the only word to properly sum up my feelings about the Boston Marathon Bombing. We were nearing the end of our visit and Ellie started to get cranky. As we said goodbye to Kevin I popped her in the sling to walk to the Jeep. We ended up staying a while longer, probably because she instantly calmed down and cuddled up on my hip. =) Aaaaaaaah, the magic of Babywearing!